The water element that we share so intimately with all other living things, is one whose essence pervades the biosphere spanning the four states of ice (crystal), liquid (quasi-crystal), gas and negatively charged bio-electrical particles otherwise known in Yogic traditions as ‘prana’. And so we come to see that life is surrounded by and suffused with shape-shifting crystallinity conveying rhythmic energies from the cosmic to the cellular. It is important at this juncture to give a clue as to how nature may pass on the baton from the mineral kingdoms to organic life. Both water and quartz naturally share a common morphic modality. Two British water researchers, Bernal and Fowler using x-ray defraction measurements showed that at a temperature of below 4 degrees centigrade water has a rhombic crystalline structure as in the crystal Tridymite, whilst between 4 and 200 degrees centigrade it has a structure like that of quartz. When assessing the quality of water it is not enough to know whether it is free from chemical pollutants, for it is the "structural” aspects of water to which most of its multifaceted talents can be attributed. It is only right and proper at this stage to raise our glasses to a few people that over the last 80 years or so have given us a wealth of insight, which if applied, could be of incalculable benefit to the health of all life systems. Cheers to Victor Schauberger, Theodor Schwenk, Felix Franks, Jacque Benveniste, Henri Coander, Gael & Patrick Flanagan, F. A. Popp, Wilfried Hacheney and F. Batmanghelidj. The work of these and other scientists has led to a greater understanding of water’s role as information carrier and basis of colloidal systems. To explain the properties of water, physicists use cluster models in which water molecules are bound loosely together in groups. Dr. W. Ludwig postulated that information up-take happens by means of a dynamic change in the water cluster structure. This could occur by the action of vibrations within molecular chains. The specific surface area of the water plays a vital role, for according to Resch and Gutman it is the molecules on the phase boundaries that take up information as in the case of succussion, the technique of agitation used in the production of homeopathic remedies. The larger the surface area produced between solute and solvent the greater the transfer of information. This propensity of water to remember underlines a difficulty in processing our drinking water. Pollutants leave behind traces of molecular patterning in water even after they have been physically removed, this is also true of distilled water. This sort of information held in our drinking water can produce adverse effects on our metabolism. It is common knowledge that the metabolic processes of all living organisms are based on colloidal solutions, blood, lymph and plant juices are obvious examples. Disturbances of the colloidal state leads to disease. It is possible to gauge the health of an organism by monitoring the colloidal state of its constituent parts. In an ideal colloidal state, dissolved particles remain suspended in solution and do not precipitate out. In order to achieve this, the effects of gravity must be nullified by other forces, the one that is most understood is the electro-negative charge or ‘zeta potential’ which colloids smaller than 10 microns naturally assume in order to maintain distance from each other, as like repels like. There is yet another force which has been the subject of much interest in university departments at home and abroad called ‘enfolded negative entropy’ or E.N.E.. Victor Schauberger who was originally responsible for bringing it to light called it ‘implosion energy’, it is also known as ‘levitation force’, a term coined by Professor Wilfried Hacheney who with his knowledge of vortexial dynamics has designed and built machines capable of producing levitated water. It was in my capacity as a practising detoxification therapist, privately persuing a line of inquiry into morphogenic potentisation, that I required a quality of water that fulfilled certain criteria, namely: 1. The water had to be free of acquired molecular patterning, rendering it suitable for re-configuration. 2. The water had to have a critical surface tension below 45 dynes per centimeter, making the water ‘wetter’ and consequently more easily absorbed by biological systems at a cellular level. 3. The water had to facilitate colloidal stability and discretion allowing the transport of nutriments into the organism and the efficient elimination of metabolic wastes. Levitated water possesses all of these characteristics. 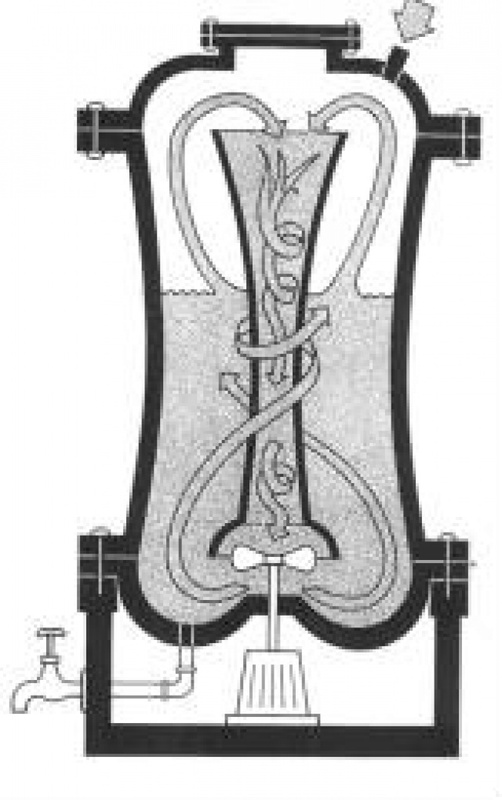 If you will excuse the play on words, Hacheney’s technical concept for producing energised water is ‘revolutionary’, he describes it thus:- Water is accelerated at great speed in the levitation machine by means of a suction rotor. The water moves upwards in a helix in the outer container in a clockwise direction. The shape of the upper end of the container ensures that the rising water is directed into the inner container. As this occurs the direction of motion is changed by means of guide plates placed at the upper end of the inner container, the water then flows down in a helix in the inner container in an anti clockwise direction. At the lower vent the water performs a circular motionin a horizontal plane where it encounters the suction rotor turning in the opposite direction. Thus substantial relative velocities approaching the speed of sound can be reached in the immediate neighbourhood of the rotor so that the water once again moves in a clockwise direction. The spacial course of the water motion therefore describes two nested contra-rotating helices. A matter of seconds after start up a clearly discernible rhythmic pulse can be heard as the pressure just above the rotor rises and falls, so that the water in the inner container is periodically drawn downwards. The process is rather similar to the compression and extension of an accordion, as the specific surface area of the water is periodically modulated. During the levitation process water is stretched over a large surface so that it is , as it were, opened up so that it can be enriched with energy by finely controlled movements in the microsphere. This changes the cluster structure and water as information carrier is initialised. The water is then compressed into an enclosed volume where the induced energy is taken up in the form of micro-vortices. Thus after the energy has been induced the water is closed up again. So it is by means of an artificial manipulation of the surface area of water, that kinetic energy is channelled into a modification of the water structure. The effect of gravitation is related to specific surface area, that is, the surface area of a body in relation to its volume. If the volume virtually disappears and the surface becomes infinitely large the effects of gravity vanish, because gravity is only effective for masses with a finite volume. The levitation process raises water from its gravity dominated state to a metastable equilibrium at a higher energy level. 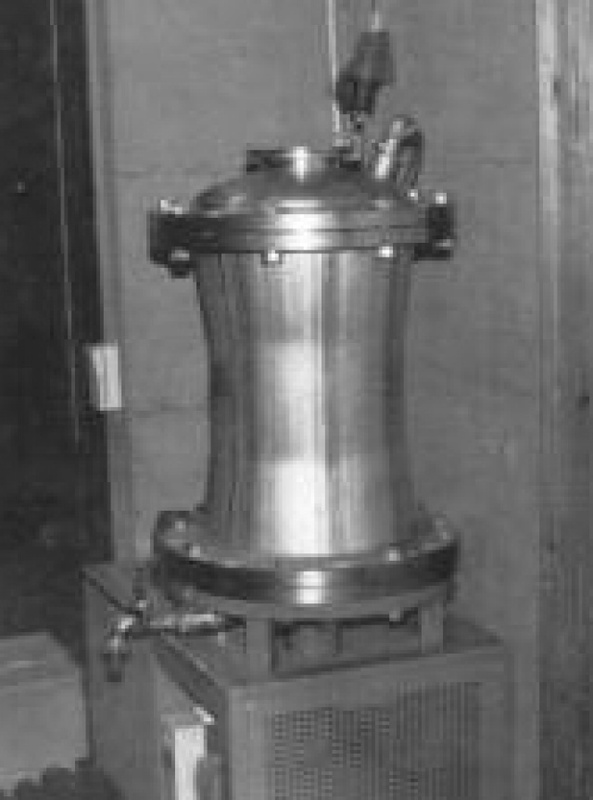 Levitation machines for the treatment of drinking water have been available to interested parties since 1987. Since then over two hundred systems have been installed world wide. The common experience of those who use levitated water is that they find it easier to drink, and that after the first glass, a second or third glass is often desired. The accumulated experience which has been medically observed and documented confirms that Levitated water improves the state of health of humans, animals and plants. The colloidal state of human blood can be examined by means of a wide range of methods, notably the Bradford Test. Degenerative diseases in particular can be identified in the early stages using this technique. The pictures above are of the Bradford Blood Test which involves putting a sample of capillary blood on a slide and examining it under a microscope. The Bradford procedure can diagnose Reactive Oxygen Toxic Substances (R.O.T.S. ), free radicals and toxic chemicals with aggressive hydrogen bonds. Fig. 1. shows blood test of a subject with clearly visible signs of a degenerative disease with strong free radical activity. The subject was found to be in the early stages of cancer. The colloidal state of the blood here is badly disturbed and the blood appears to be falling apart. Fig.2. shows the same subject after 80 days of drinking 1.5 litres of Levitated Water, per day. Fig.3. shows the continuation of the same level of consumption for a further 80 days, indicating a regenerated colloidal state and an absence of R.O.T.Ss . Furthermore, the extent of resulting cancers among patients in a pre-cancerous condition were on average reduced by 38% .